I’ve have heard people complaining that there’s too much waste when clean eating. Some people feel this way because other family members won’t eat from the same clean menu. Some people are apprehensive about clean eating as they claim that it’s too hard to figure to plan a lunch menu. Still others confess to being bored with eating the same thing over and over. I totally disagree with all of the above statements and think you will too after trying my clean veggie soup! This delicious soup allows me to make one item on the dinner menu, as everyone loves it, even if they’re not clean eating. Canning the leftovers allows me to have access to a quick and delicious lunch at home or on the go, or have it months later for a delicious supper. This soup is anything but boring! I love making homemade clean vegetable soup. However, as many can witness when making soup there’s often an abundance leftovers. I’ve tried freezing soups in the past, which worked out pretty good, but not as tasty as a fresh pot of soup. So, the last time I made this delicious soup I decided to can the left overs. It worked out great! I actually ate a bowl of it today for lunch…and it was delicious! I’m excited to share not only my recipe for clean veggie soup, but also the directions for canning this delicious soup. Okay, first things first the ingredients. Chop onions and peppers to desired size. I like to chop mine rather large for more of a bite. Place a couple of tablespoons of extra virgin olive oil in a large dutch oven and heat over medium heat. Tenderize onions and peppers in olive oil and season with salt and pepper. Add very lean choice of meat in the same pot and brown with onions and peppers. Stir in garlic and add red pepper flakes and cumin. Drain if necessary. If the mean is lean enough there will be little to no drippings to drain. In the same pot begin adding vegetables one at a time and stirring. When all the vegetables have been added incorporate tomato juice. You may add more if desired. I sometimes add a little water. In a separate kettle boil peeled potatoes and sliced carrots and add salt and pepper, boil until a knife will pierce but still have a bite. This is a great supper for a cold relaxing evening at home. It’s also a fantastic soup for lunch. Very filling and deliciously clean soup that will leave full and guilt free! Now for canning those delicious leftovers! You will need very few things to can this delicious soup. You will need clean sterilized pint jars, rings, flats, and a canner. The steps to can it are as simple. Simply fill clean, warm, and sterilized jars with warm leftover soup. It’s important that the soup is warm to prevent jars from breaking. Also, leave approximately a half an inch to an inch headspace. Wipe jars clean and place flats and rings on them. Don’t tighten the rings extra tight, as you can do this after the jars are removed from the canner. Place warm jars of soup in a canner of warm water, bring water to a boil, and boil for 45 minutes. Remove jars carefully from water and allow to cool. Dry jars and check to ensure that each jar has sealed. Secure the rings, and date the soup. Seriously, this soup is as good, if not better after being canned than it was the day it was made! I typically will have enough soup left over to can at least four or five pints of soup. I hope you and your family enjoy this soup as much we do! It’s delicious! It’s clean! It’s satisfying and as savory the day you make or six months later when you want it for lunch! If you enjoyed this recipe feel free to check out all of my canning recipes! Also, please feel free to leave comments. I love to hear from my readers! Happy canning! Okay, so when I embarked on this clean eating journey my food intake changed dramatically, as did my grocery bill. Many of the foods that became a staple in my pantry were on my husband’s list of favorite foods to eat. I found myself buying groceries for two different menus. To decrease the expenses we decided it was time to increases the produce in our garden. We both enjoyed the majority of the vegetables. I saved a bundle on zucchini, squash, cucumbers, and cantaloupe alone! As much as this helped our budget, encouraged me to eat healthy, and also provided vegetables for our family, there were some things on my grocery list that we couldn’t grow! I had a desire and a need to reduce my grocery bill. I was determined to find ways to trim back, and cut corners. So, I decided that coupons would be my first choice. I’ve always enjoyed saving a little money here and there with coupons, but most of my coupon experience was limited to accidentally stumbling onto a coupon in the insert from the Sunday paper, or a magazine. I needed to get into some serious couponing. No, not extreme, but serious. I read as much as I could online about shopping with coupons, bought a few e-books, and watched the amazing show about extreme couponing. It all seemed complicated, but remember, I was determined to save money! Before long, I figured out a system that worked for me. It wasn’t complicated, and it didn’t involve a lot of time, but I was saving money! I clipped coupons, scoured the sale papers, loaded online coupons to my Kroger card, printed free coupons, bought from coupon clipping services, and watched sale weekly sale papers. I also loaded a few apps to my phone that added to my savings. These apps worked with stores such as, Aldi’s, The Dollar Tree, Wal-Mart, Kroger, and The Dollar General. I frequently use Checkout 51, Ibotta, Wal-Mart Savings Catcher, and my Plenti card. The savings from these apps can really add up quick! Over the past three years I have learned a lot about clean eating, using coupons, finding the best sales, and using them to stock my pantry. Today was a great day of savings. The day began at Wal-Mart when I purchased a 16.5 Purina Small Bites dog food for just 1.00. This was made possible through the use of a 4.00 coupon that I clipped from the insert in the Sunday paper and a 7.00 check from Purina. My husband saves circles from bags of Purina dog food that we mail to the Purina company in exchange for checks that are redeemable for more dog food. That’s instant money! Using the combination of the coupon and the Purina check I bought a 16.5 bag of dog food for just 1.00! A total savings of 11.00. 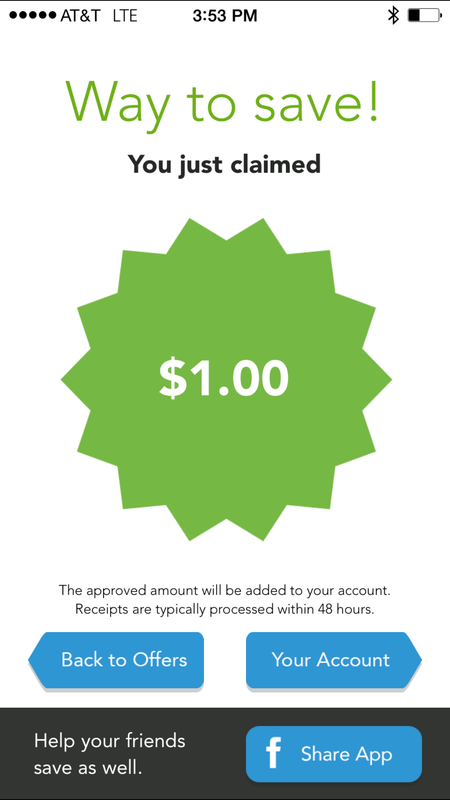 I purchased ten more of the 4.00 coupons from Klip 2 Save, which is my favorite coupon clipping service. 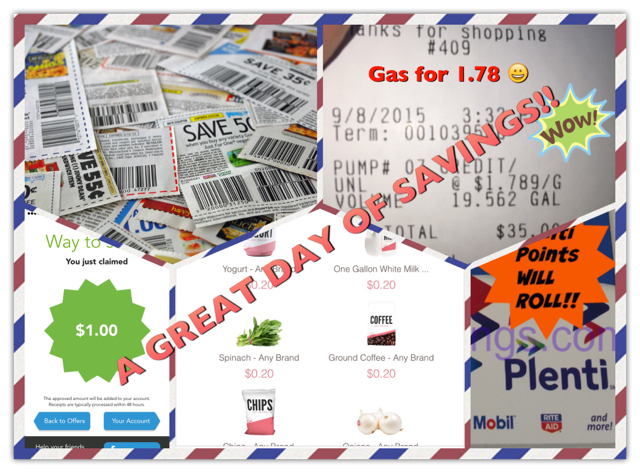 Each coupon costs a couple of cents, but still reap a huge savings! My plans are to fill our dog food bin for the winter for only a few dollars! I left Wal-Mart and headed to Kroger for even more savings. Checking my list, I carefully scoured the Kroger shelves, selecting items that were on sale, close out items, as well as items from the reduced price bin. The deals were fantastic! I found usable and worthy items in the close out and reduced items bin that I had coupons for! I was pumped! I made my way to the checkout line with a cart running over with super deals! I had set a dollar amount that I didn’t want to exceed! As the total quickly began to climb, I was a bit nervous about the cost before my Kroger card was swiped…it exceeded my goal. But, after swiping my card, and handing my stack of coupons…my total sale was far below my budget! My total savings for a huge haul of groceries was 59.76. I was pumped! Now, on to the gas pumps for even more savings, just another reason that I love shopping at Kroger! 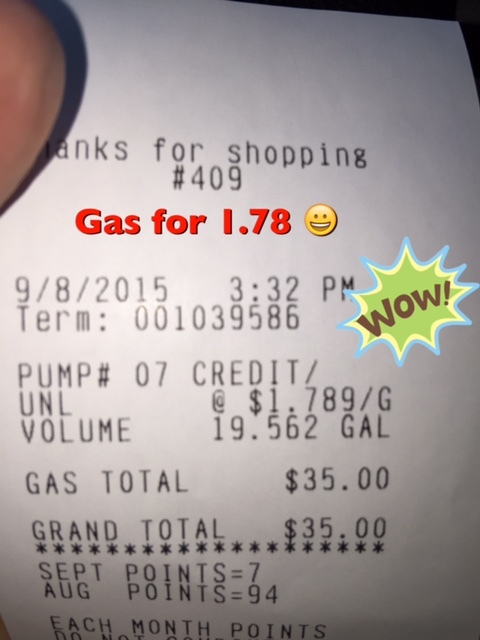 When the computer at the pump ask if I wanted to use my full .20 of savings, I selected yes with a grin on my face! I would get my gas for 1.78. I hadn’t paid this little for a gasoline in quite some time! A total savings of 3.80. I love saving at Kroger! The next stop on my route would be Rite Aid. I was on a mission to find hair color at the lowest price possible. I had a couple of 3.00 coupons and a few buy one get one free coupons, that meant I could get two boxes of color for 2.00. I picked up six boxes of hair color and strolled up to the check out counter. The price rang up and I swiped my Plenti card. I noticed my accumulated points and decided to use them. I was thrilled to discover that the six boxes of hair color that I planned to pay two dollars for…was totally free! This freed up my coupons as well for future purchases. I left Rite Aid with six boxes of hair color that I purchased for 0.00! A savings of 28.00, and enough hair coloring to last for a year! My final stop would be The Dollar Tree. Again, I went on a mission! I was going in to purchase Gain fabric sheets and Hall’s cough drops! Again, I presented paper coupons for the Gain fabric sheets. I paid 1.50 for the fabric sheets, instead of 3.00. As soon as I got in the jeep I quickly used the Check Out 51 app to scan the receipt receiving a 1.00 for one of the bags of cough drops! Total savings 2.50 on a 5.00 purchase! Once I arrived at home, I was excited to share the huge amount of savings with my husband! As we put away the huge load of groceries, I scanned the bar codes for savings on items that were offered on Ibotta. 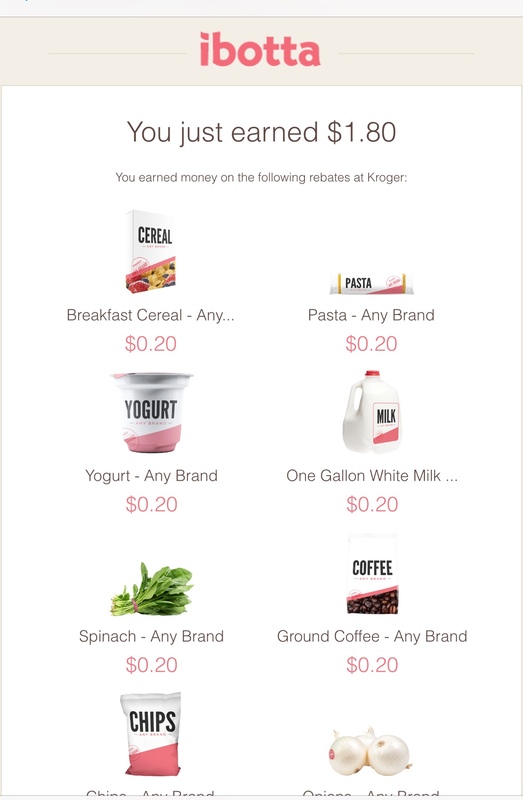 With a full pantry of groceries that satisfied the needs of clean eating, healthy eating, grandchildren’s cravings, and my husbands midnight snacks, I sat down to scan the lengthy Kroger receipt for Ibotta. Cha-ching…1.80 was added to my Ibotta account! It was a great day of shopping and a great day of savings…not to mention a full fridge, full pantry, full tank of gas, and enough hair color to last for a year! But, the best part of all…my total savings for the day was 106.86! Be sure to check out my post The Journey Begins to find out more about my journey to a healthier life style.